Playful Collaborative Learning - Computational Creatures 1.4 — Wonderful Idea Co.
On thursday at the #WICO computational creatures summer camp, tinkerers continues combining high and low tech tools and technologies. 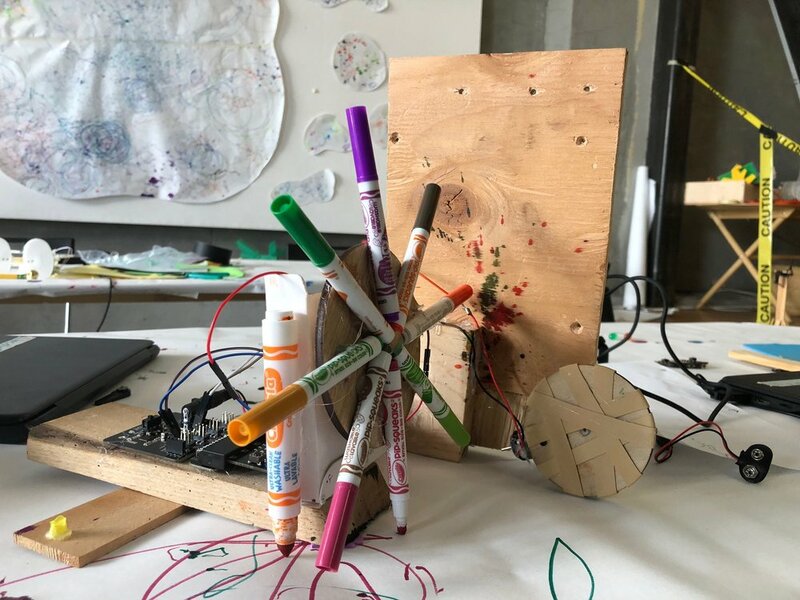 Some groups spent the morning finishing up their twisted turtles (programmable art machines) and other groups started new projects to go deeper towards thinking about these digital and analog materials. There are so many variables to explore with these machines and I was excited to see some of the groups return to the project and complexify their ideas. It was super interesting to see how some of these contraptions became art machines not only in the way that they drew patterns but also because the designs started becoming more like kinetic sculpures with clear aesthetic choices. 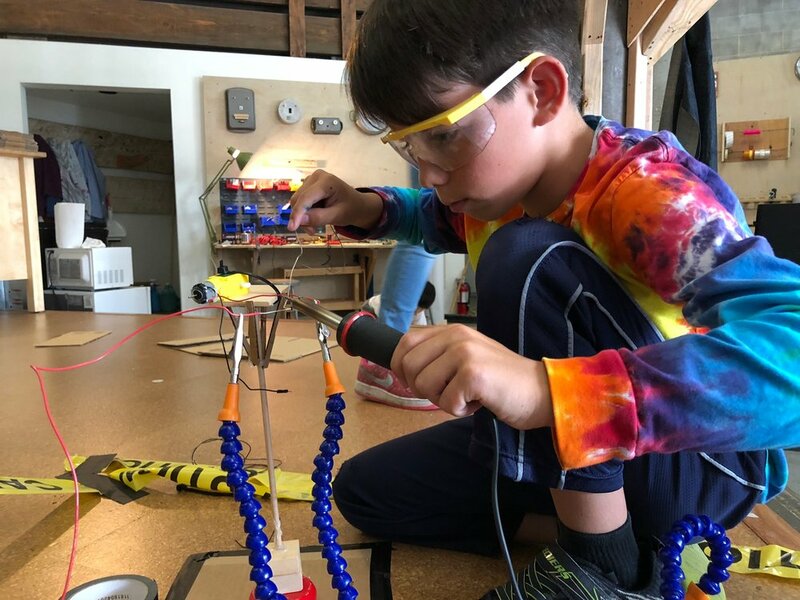 Some of the groups are working on more free form tinkering projects including this mash-up project that uses programmed lights and motors, resoldered "guts" from the toy dissection adn a cardboard box from the automata activity. Another group has been working on a "sky parade" like project with a pulley system, two extended microbit motors, and wooden towers.. Tomorrow their hoping to design the 'ski-lift' cars and add programmed lights. The other groups are working on a variety of projects that include a castle with a programmed draw bridge and a continuation of the WICO camp cruise ship drawing machine from wednesday! My favorite part of the summer camp so far is how we've been able to create a space where facilitators are able to learn alongside campers. This is the first time for us to work with microbit and moto:bit with a group of kids and we're not experts in the hardware or software. We're modeling asking the right questions, testing out ideas, asking each other (and the group) for help and developing our understanding of these technologies. With this spirit, I'm excited to see how these ambitious projects come together tomorrow as we make final preprations to share our half-baked ideas, works in progress and collaborative projecs with parents and friends.